Singapore harbours a very rich terrestrial and aquatic biodiversity which consists of over 2000 native plant species, more than 300 native birds and 300 native butterfly species, over 250 hard coral species, and much more. The best of it all is that this incredible diversity is minutes away from anywhere in the city. However, the question is does nature and our rich biodiversity influence and guide the lifestyles of an average Singaporean? Interacting with our family, friends and neighbours, we know only a small proportion of us in Singapore make lifestyle choices around nature and nature conservation. How could we transform this paradigm such that nature becomes an integral part of the Singapore lifestyle? Every Singaporean A Naturalist or ESN in short is a new initiative by the Nature Society (Singapore). 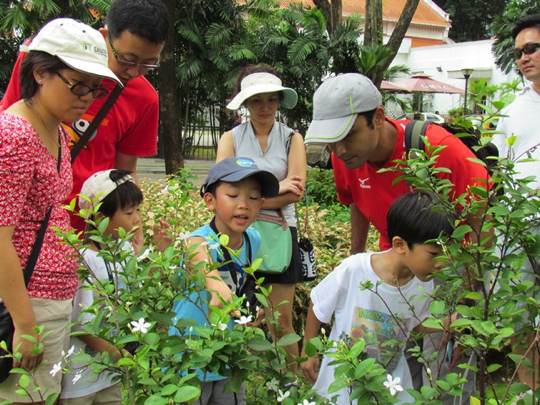 It is part of the society’s wider citizen science engagement strategy aimed to equip Singaporeans with hands-on nature conservation activities. Activities that can inspire them and make them knowledgeable about nature. Young citizen naturalists exploring urban flowers and their butterfly visitors. ESN aims to equip young citizen scientists with skills to identify, monitor and hopefully appreciate common species of birds, butterflies, plants, mammals, frogs and lizards in their schools so they can be engaged in a long-term study and appreciation of nature in Singapore with experts and volunteers of NSS. With funding support from HSBC for a period of 3 years, the program currently targets primary, secondary and tertiary schools but it will eventually be expanded to the wider public. As the program expands across Singapore, together we will be know what are the common fauna and flora in urban Singapore and how do they change across months and years around us! The program announcement in Nature News Sep-Oct 2017 can be found here. The program was piloted at primary, secondary and tertiary schools in the first school term from January to March 2018. Leading to the pilot stage, teachers are being engaged, and training sessions conducted for young citizen scientists to familiarize with the fauna and flora around them. A full rollout is planned in mid-2018. Check out the details as below. The following schools participated in the pilot program - Queenstown Primary School, Unity Secondary School, Chung Cheng High School (Main), National Junior College (Secondary), NTU Asian School of the Environment and NUS BES Drongos. Read about the pilot stage of the program in Nature News Mar - April 2018 issue here. Interested in joining the full rollout? We are currently accepting new schools into the program! If you are interested in knowing more and/or participating, please contact esn@nss.org.sg.